Media captionProsecco v champagne: Which one tastes better? It's Friday and across the country, people will soon be clocking off with a glass of fizz. Sales of the Italian wine are soaring faster than you can say "I'll be there in a prosecco", but what's the secret behind its sparkling success? On Instagram, there are almost two million photos tagged #prosecco and a further 12,000 for #FizzFriday. Even Theresa May's future has been debated over a glass of sparkling Italian wine. Supermarkets are stacking their shelves high with bottles that give you change from £10 and bars up and down the UK are promoting it as an affordable, weekly treat. But its success is not solely down to cost. "It is targeted at women," says Vhari Russell from the Food Marketing Expert. "Many of them like to drink bubbles and bubbles are associated with luxury and celebrations. "It is served in beautiful glasses and can be seen as very classy." Image caption Has prosecco become the go-to celebration drink? 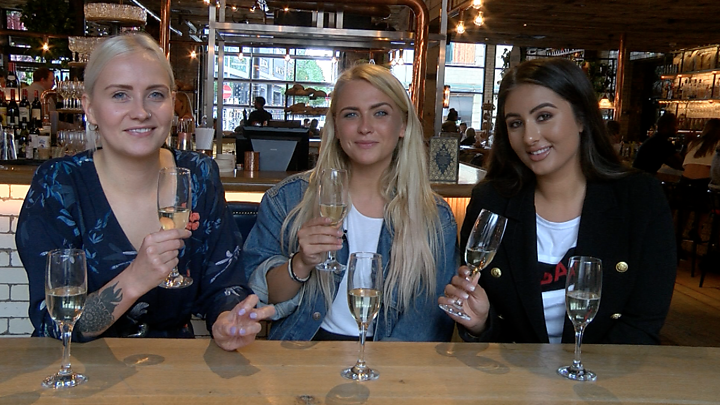 In a bar in Birmingham a group of women are sharing a bottle of prosecco. "It feels very feminine," says Bev Gordon. "It just makes you feel more sophisticated," her sister, Jennifer Tristham, adds. "We'll drink it at house parties, when we're out, at little reunions... it's now become part of our lifestyle," their friend, Wendy Johnstone, explains. According to Richard Halstead from market researcher Wine Intelligence, the beverage could be described as the "phenomenon of the last five years". He said it is "wildly popular" among women in their 20s and 30s who post pictures on social media of themselves clinking glasses and popping corks. Media caption"Drinking prosecco is part of our lifestyle"
It is a trend Alex Windsor and his fiancée, Sophie Andrews, spotted when they gave up their jobs to launch a mobile prosecco van. "We see a huge amount of people taking pictures with glasses and putting them on social media sites," says Mr Windsor. "Prosecco is a lot cheaper than champagne and a lot of people tell us it tastes nicer. It is a much more affordable drink, but gives [off] that elegance you get with champagne." Ms Russell says prosecco has now overtaken champagne as the go-to drink for big occasions. But cutting back on luxuries in favour of an affordable alternative started in the wake of the 2007 financial crash, according to Mr Halstead. "No-one sees the bottle, or pays much attention, so there was the easy trade-down from champagne [to prosecco] if you were hosting an event," he says. 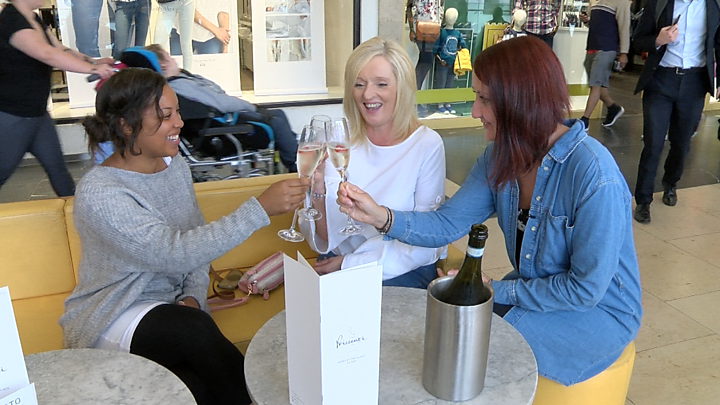 Supermarkets were also quick to jump on the bubble bandwagon, adding prosecco to the "dine in" meal deals designed to mimic restaurant-quality food without the hefty bill, says Ms Russell. But the marketing genius was really in its pricing, with many chains offering bottles at discounted prices. "If you can't afford to go on holiday or go out to dinner, the idea of having a mini celebration with change from £10 is a strong pull," Mr Halstead adds. It's a move that has paid off for major retailers. Lidl has seen sales of its own brand bottles grow by 79% in January 2017 compared to the same month last year, while Marks and Spencer's prosecco sales saw a 25% rise from 2015 to 2016. Waitrose saw a 12% increase in sales since last year and said the nation's love of the sparkling wine has grown so much they will be releasing a prosecco turkey in time for Christmas. So is prosecco here to stay or will it fall flat like its once fashionable Spanish counterpart, cava? Paul Creamer, wine buyer at Loki Wines in Birmingham, says they no longer stock the once-popular sparkling wine as there is no demand for it. He says cava is having a personality crisis and believes it would take a marketing miracle for it to get back on the same playing field as its counterparts. "The problem is that the global image of champagne is very well managed compared to that of cava," Mr Creamer explains. "It would take a seismic shift in cava marketing to reposition it in a different niche or price tier with the wine market." Food and drink journalist Paul Fulford thinks cava is often associated with an older generation of people that first holidayed in Spain - in a similar way people associate sherry with their grandparents. But he says cava is actually better quality than prosecco. "It has a more superior taste because of the way it is made, the fizz is more integrated, making the [bubbles] less likely to disappear. And the flavour is better," he adds. Similar methods are used in the manufacture of champagne, cava and prosecco, but with crucial differences that set each other apart. Champagne uses the "methode champenoise", which requires it be made from the region's grapes and fermented in the bottle for at least 15 months; cava is formed from a blend of wines and ferments for nine months as per the "methode tradicional", while prosecco implements the "Italian Charmant" method - fermenting in steel tanks. But can you really taste the difference? At Albert's Schloss in Manchester, Katie Matkin thinks so. "I've had champagne before and it tastes heavy, I didn't like it," she says. "Whereas everyone seems to like prosecco. It's cheap, it's light, it's easy, you can add things like syrups." Prosecco's versatility as both a standalone drink and mixer has helped broaden its appeal. Rather than fall foul of nostalgia it has embraced it, even aiding in the resurrection of the Aperol Spritz - a cocktail popular in the late 1980s which has reappeared in countless pubs and bars. Looking to the future, there are now skinny, vegan and organic versions of the drink available, as well as sweets, candles, bubble bath and even "pawsecco" for your pet. So is it just flavour of the month? Mr Fulford thinks not. "It feels like indulgence without the extravagance, most of the varieties are so easy to drink and it suits everyone's palate," he says. "It is here to stay, it's ingrained in people's drinking habits." Perhaps prosecco's popularity is a combination of things - its marketability, the ceremony, and the perception it gives. But fizz fan Tamara Poxon thinks there is a simpler explanation. "When you compare it to the price of champagne, there's no reason why somebody wouldn't drink prosecco." Does prosecco have health benefits?